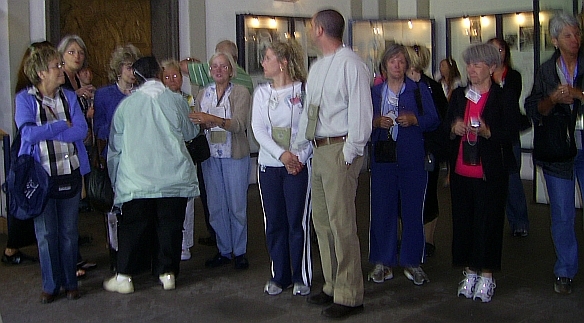 A group of 50 Americans from Louisiana and Texas are on a 16 day tour of Shrines in Germany,Belgium and France. 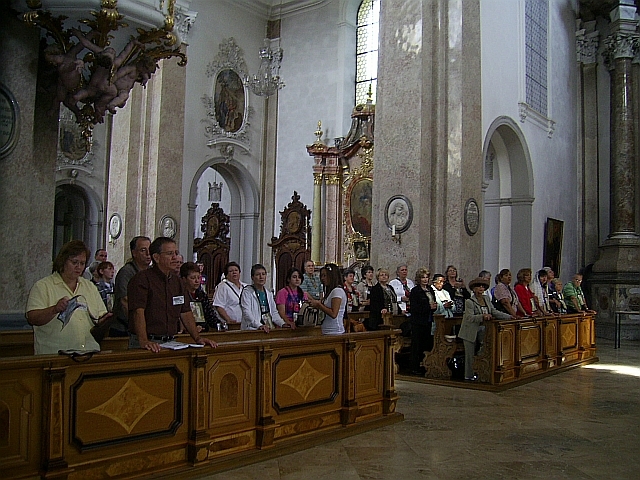 The "Come Holy Spirit Pilgrimage-Retreat" is the 15th Annual Pilgrimage with Father Manny Fernandez and it kicked off in St Mang Basilica,Füssen on Monday 9th June 2008.Father Emmanuel Fernandez,Parish Priest of St Stephan in Berwick,LA,USA, celebrated Mass in English for the Pilgrims. During his sermon at the opening Mass of the European Pilgrimage,Father Fernandez told those present that the success of the Pilgrimage depends on everyone on it.Prayer is so important.It is wonderful to start the day with Holy Mass.He explained the importance of community prayers and also how praying alone in quiet prayer helps to build up the soul. "It makes you stronger,more peaceful and happy"he told them.He also urged all to go at least once to confession during their time together. "Be poor in spirit as the gospel tells us,Live simply and share with others"was his message to all. During the Mass they also prayed for a newly ordained Priest,Father Clint Trahan who is to join them.He will be bringing a "quadraplegic pilgrim who is hoping for both spiritual and physical healing as they visit the different shrines. 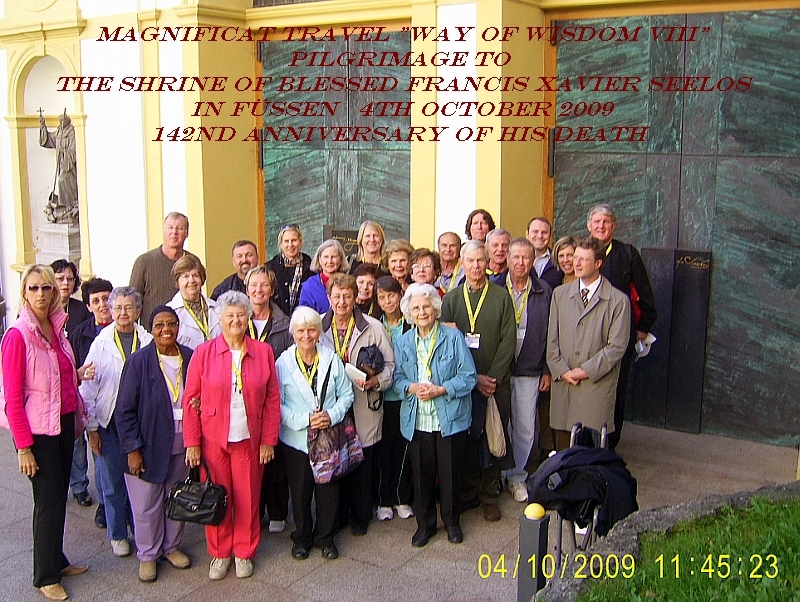 During every Mass on the Pilgrimage all wear specially designed scapulars which show the different spiritual places they will visit.The pilgrimage takes place every year and they visit different places each time. 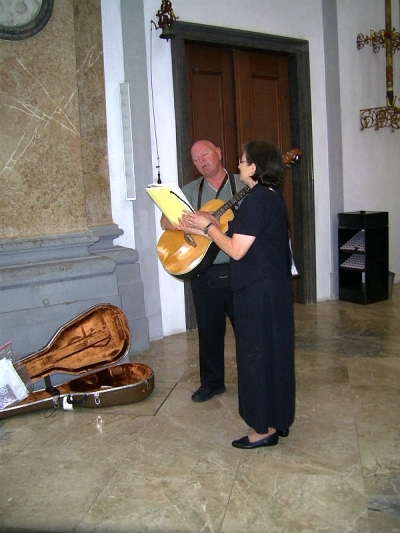 Herr Schropp,who regularly guides German pilgrims around the Basilica,welcomed the Pilgrims to Saint Mang after the Mass and told them a little about the Saints who are linked to the Basilica. 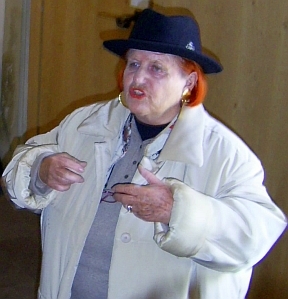 The group were then introduced to Frau Lily Neumaier-Aschenbrenner,the great grandniece of Blessed Francis Xavier Seelos. 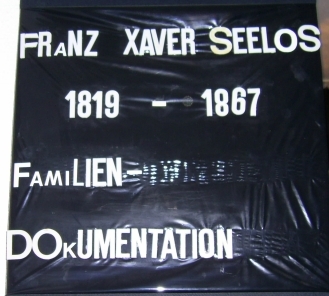 Frau Neumaier-Aschenbrenner has since 1964 been promoting the cause for canonization of her relative. 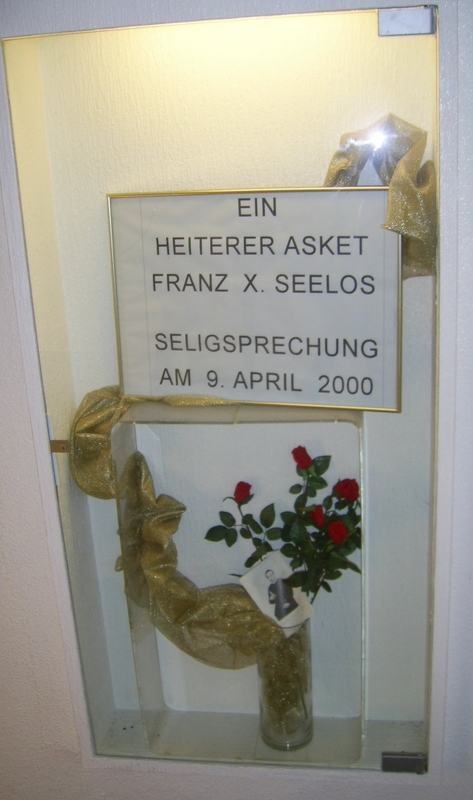 She has spoken in that time in over 24 countries,spreading the word about the love of Christ,that Blessed Seelos had. 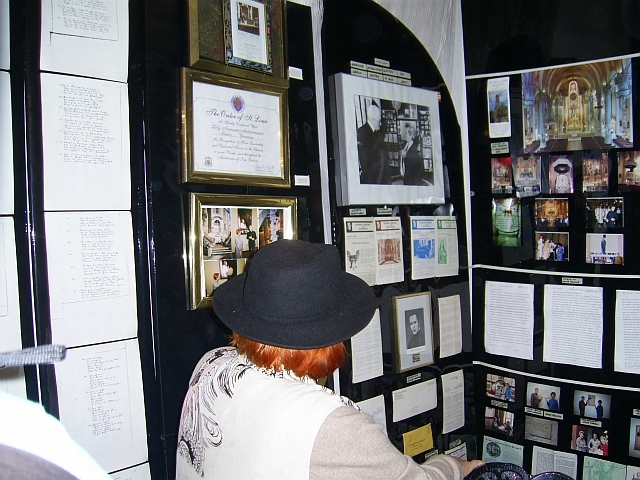 Also on the Pilgrimage and visiting the shrine of Blessed Seelos for the first time was Joyce Bourgeois. 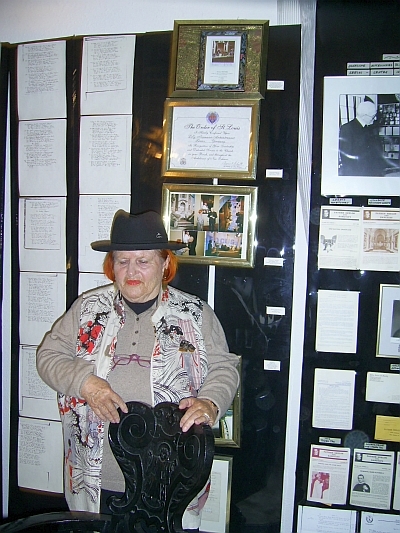 Joyce is the Administrator of the International Shrine of Blessed Francis Xavier Seelos in New Orleans. 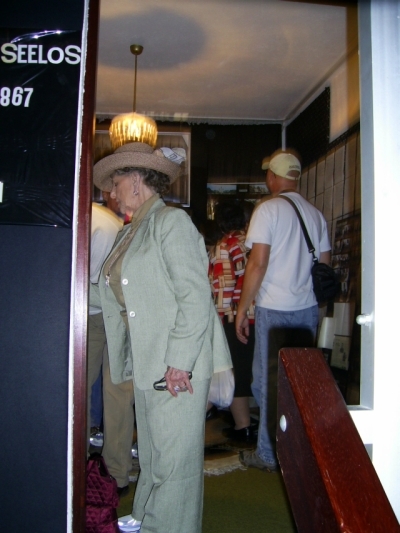 She told us she was visiting "By the grace of God". 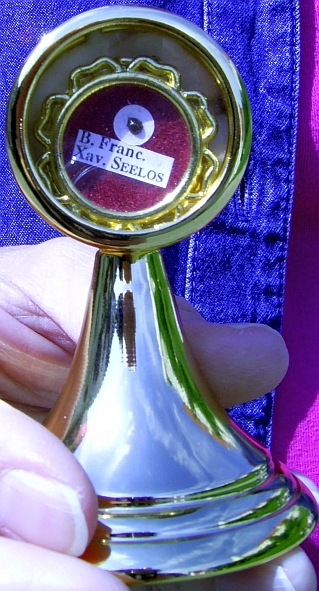 The group have with them a relic of blessed Francis Xavier Seelos.We thank Susan Sternberg,a parishioner of St Mar'ys Assumption Church,New Orleans for allowing us to photograph her 1st class relic of Blessed Seelos. 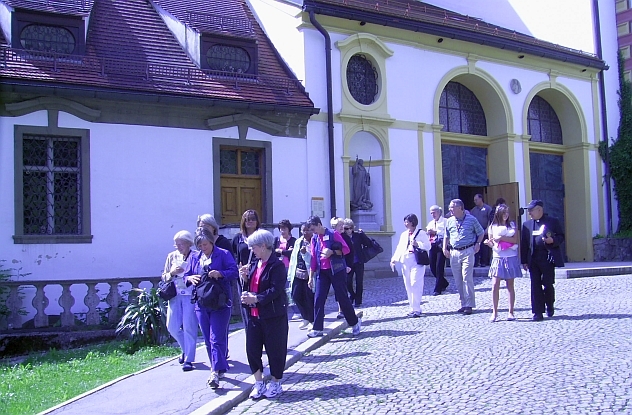 After the group picture outside of St Mang Basilica,the group were invited to visit Frau Neumaier-Aschenbrenner's house.Within the house she has a room on the 3rd floor which houses the family documents pertaining to her past relative. 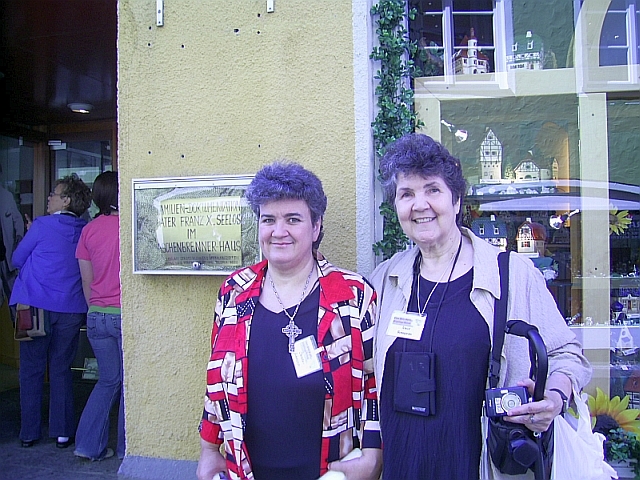 Joyce Bourgeois,Director International Seelos Shrine,New Orleans(R) & her daughter,Christine who also works at the New Orleans Shrine,outside the house of Frau Lily Neumaier-Aschenbrenner,one of the last surviving relatives of Blessed Seelos.Joyce told us that Christine is her "Seelos Miracle".Her daughter survived meningococcal Meningitis against all the odds that the doctors gave her thanks to the intervention of Blessed Seelos. Frau Neumaier-Aschenbrenner gets the pilgrims to sign her guest book whilst she shows them the documents.Anyone can visit the family documents between 1600hrs-1800hrs on a Tuesday or Friday. 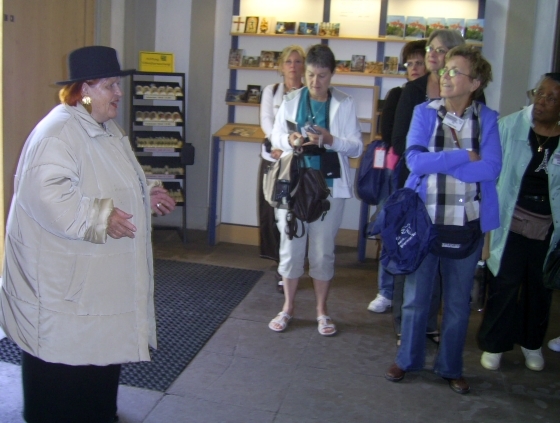 The rest of the day the pilgrims were able to visit the Hohes Schloss(High Castle) which used to belong to the Prince-Bishops of Augsburg.They also visited many other places in the city. 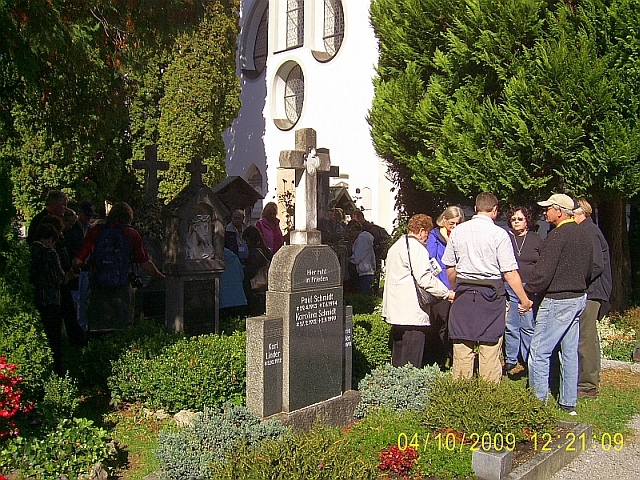 Concentration Camp, and the Church Approved apparition sites of Beauraing and Banneux. The organizer of the Pilgrimage,Bonnie Latidais told us that all on the Pilgrimage were looking for spiritual,physical or mental healing of some kind.A special healing service will be held as well. 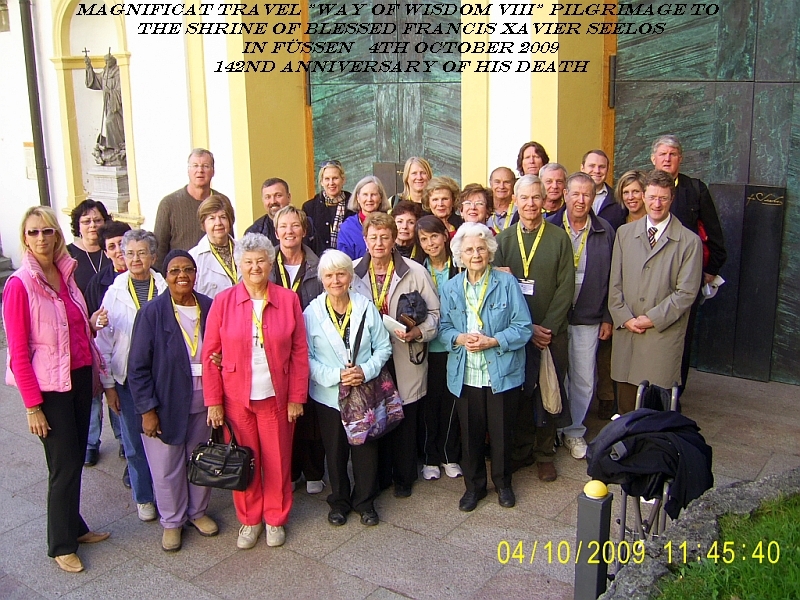 A group of 27 American Pilögrims led by Father Hampton Davis and Father Curtis Mallet arrived in Füssen on Sunday 4th October 2009.The two priests con-celebrated the 1030hrs Harvest Festival Mass in the Basilica of St Mang where Blessed Seelos was baptised 11th January 1919 the day of his birth. 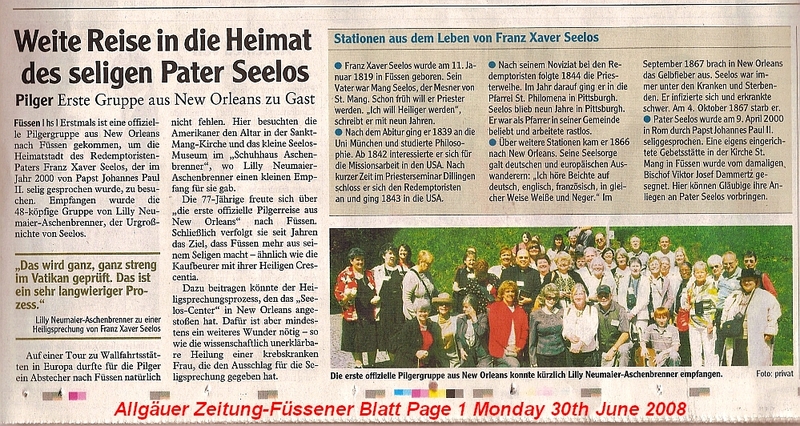 They were leading a Pilgrimage for Magnificat Travel which is visiting places in Austria,Switzerlans and Germany.As the group is from Louisiana it was only right that a visit to the German Shrine of Blessed Francis Xavier Seelos would be on the itinery. 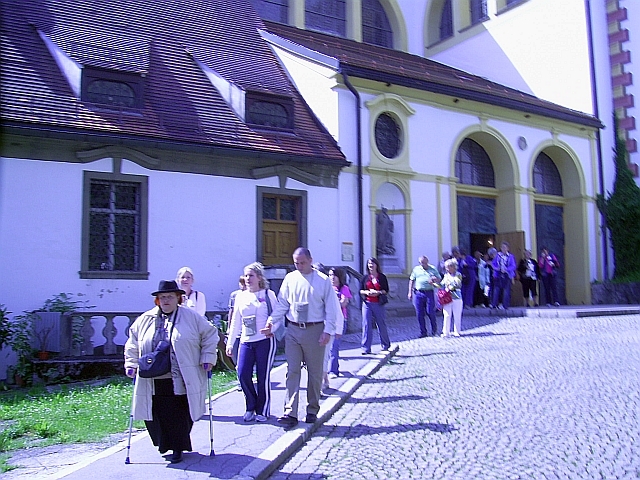 After Mass they gathered with Parish Priest of Füssen,Father Frank Deuring to have a group photo taken out side the Basilica beside the SEELOS DOOR. 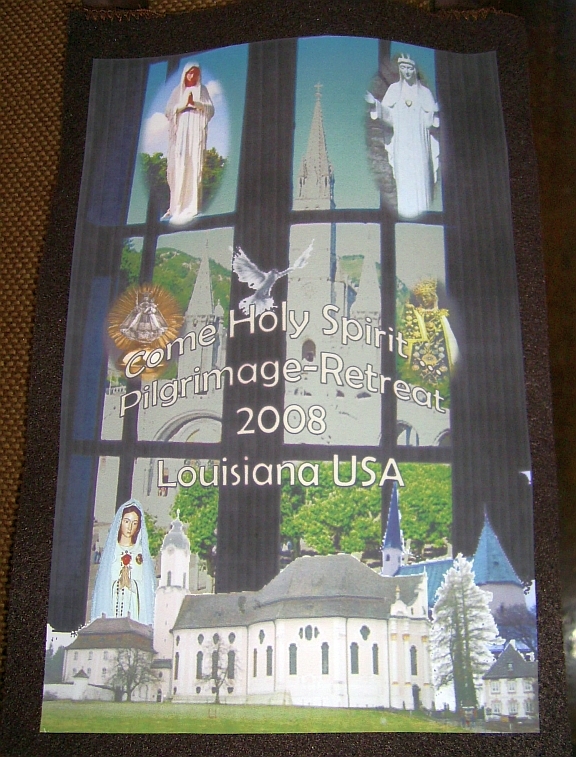 The local paper sent George Rehm,who works in the Parish on social projects to cover the event for them. 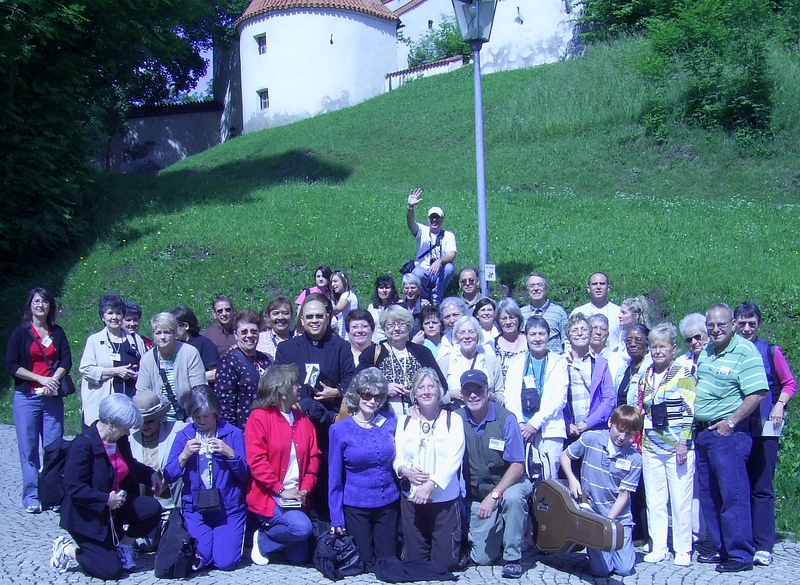 After the group photo one of the guides of the Basilica,Eduard Schopp gave the group a tour of Füssen which included the Shrine,The baptistry where Blessed Seelos was baptised. 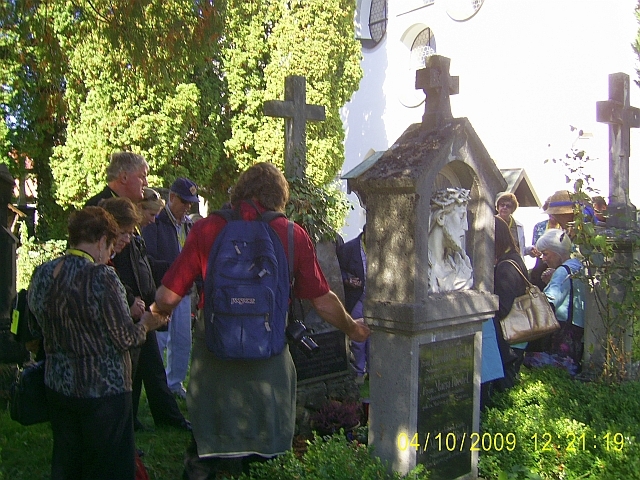 A young child was about to be baptised whilst the group were there and Deacon Fredl Hofmann who was conducting the Baptism told the group that this was the very Baptismal Font where Seelos was baptised. 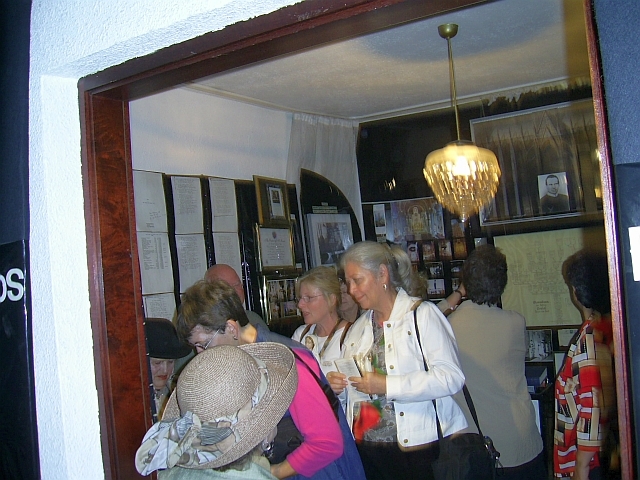 They then were shown the house where he lived when his father became sacristan of St Mang Basilica.Moving on around the corner they were shown the former Benedictine monastory of St Mang which was closed in 1803 due to secularisation.It is now the City Town Hall!.They were shown the outside of the Holy Spirit Hospital Church before turning left into the road where Blessed Seelos was born.After viewing the house which moved many to silent prayer,they walked up the hill to the old St Sebastian Cemetary where the Parents and family of the Blessed are buried. 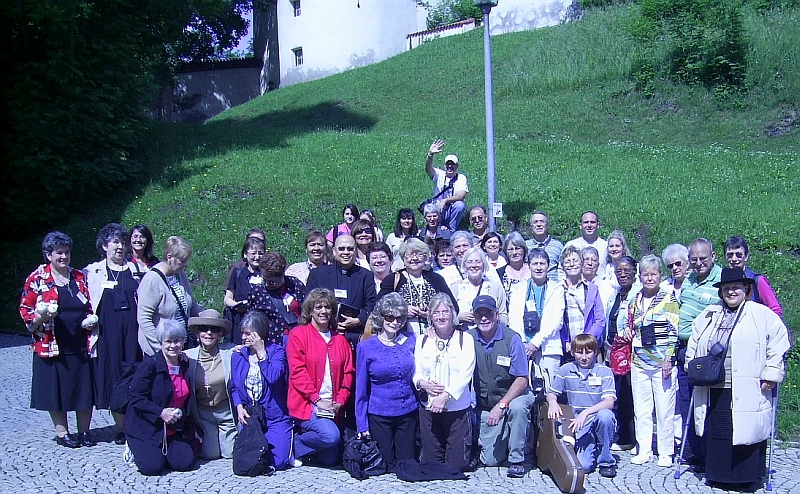 Following prayer led by Father Hampton Davis for the parents and family of Blessed Seelos and for all parents and families of those gathered,the group caught their bus to the local world famous castle of Neuschwanstein. 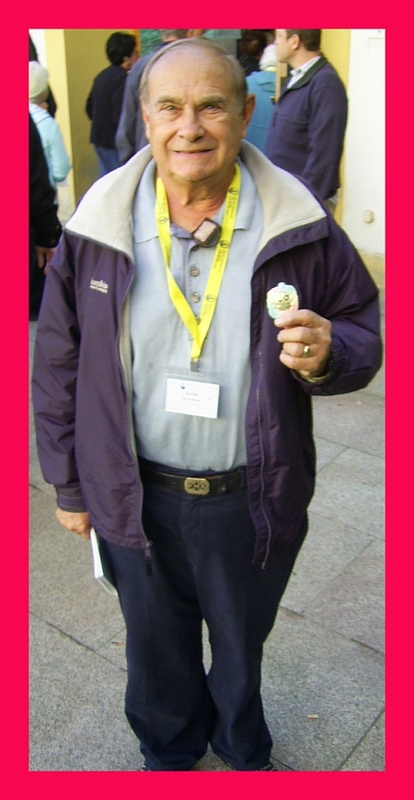 DID EMILE SIMONEAUX RECEIVE A MIRACULOUS CURE DUE TO BLESSED SEELOS? One of the pilgrims on the tour was Emile Simoneaux.He had been suffering an eye problem and had to undergo surgery.He took a third class Seelos relic in the operating threatre with him.Whilst undergoing the operation the whole theatre was suddenly illuminated with light.The surgeon was so amased that Emile was able to survive as the prognosis was so bad,He came to find out more about him.Emile's wife told us "It was a real miracle,they didnot expect Emile to survive and he did due to Blessed Francis Xavier Seelos".